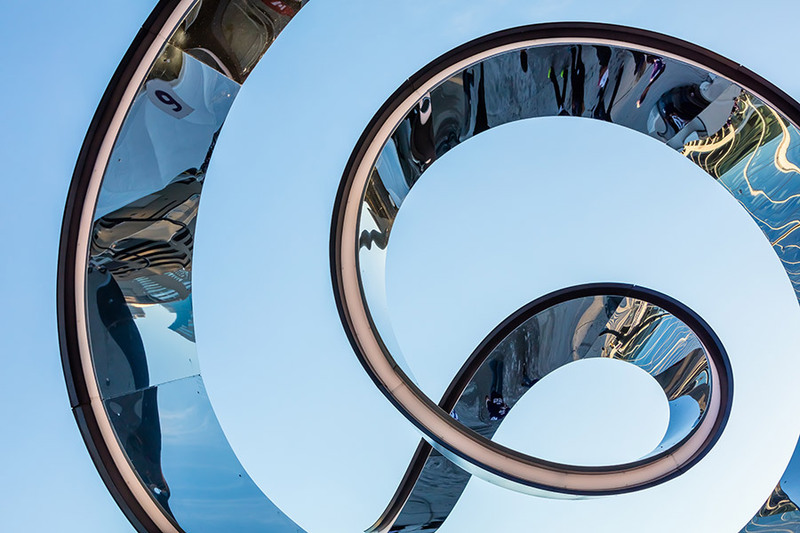 COMMUNITY: The monument is the product of two separate but entwined ribbons that work in concert to form the installation, thereby reflecting Medtronic’s brand promise “Further, Together.” Mirrored panels on the interior surfaces of these ribbons reflect visitors’ faces as well as views of the surrounding city-scape and sky. 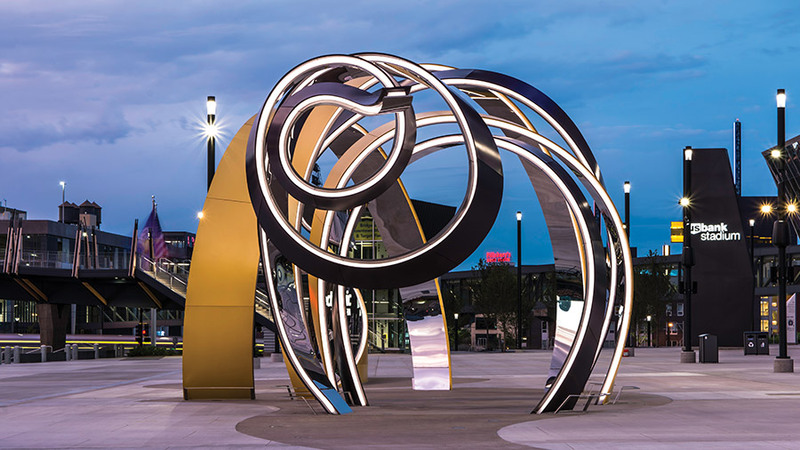 At its north end, the sculpture frames a circular plaza space intended for street performers and bands. 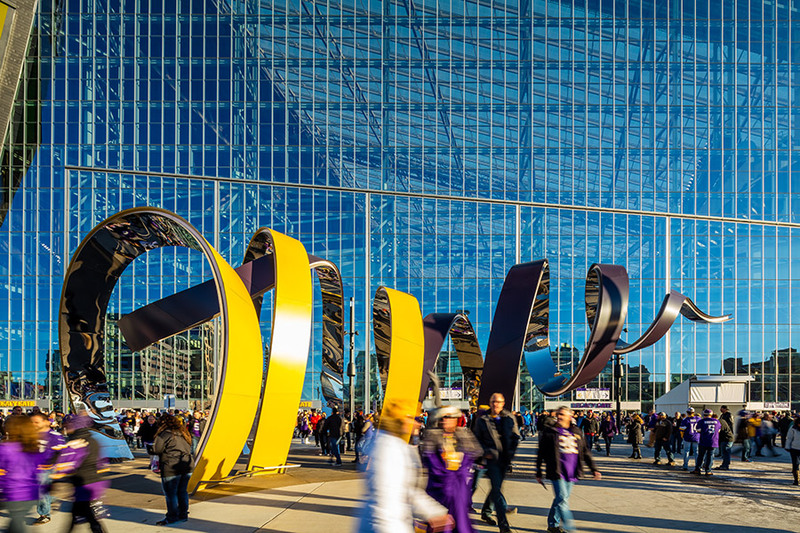 VIKINGS FOOTBALL: Viewed from the outside, the monument traces the shape of a Viking “Gjallarhorn” battle horn (laying on its side), clad in team colors. The Horn is approximately 107 feet long x 25 feet high x 30 feet wide and weighs more than 38 tons. 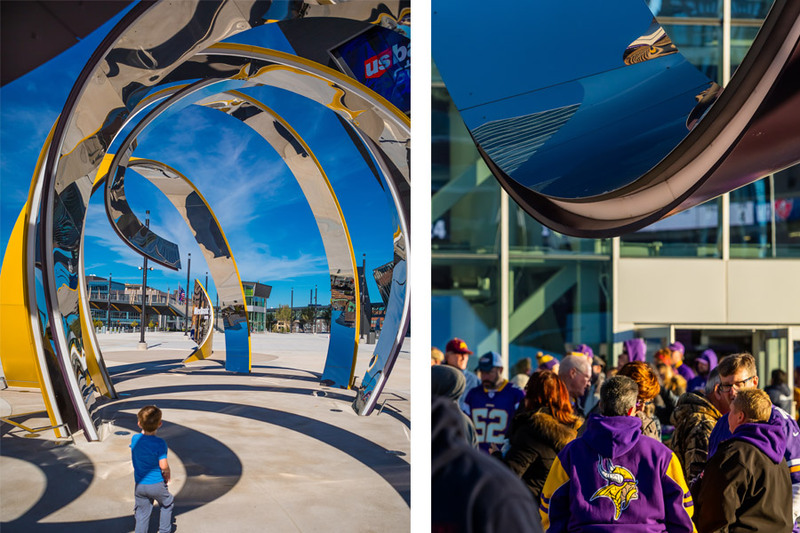 Its ribbons consist of steel box structures clad on the outside with purple or gold aluminum and on the inside with mirror-polished stainless steel. 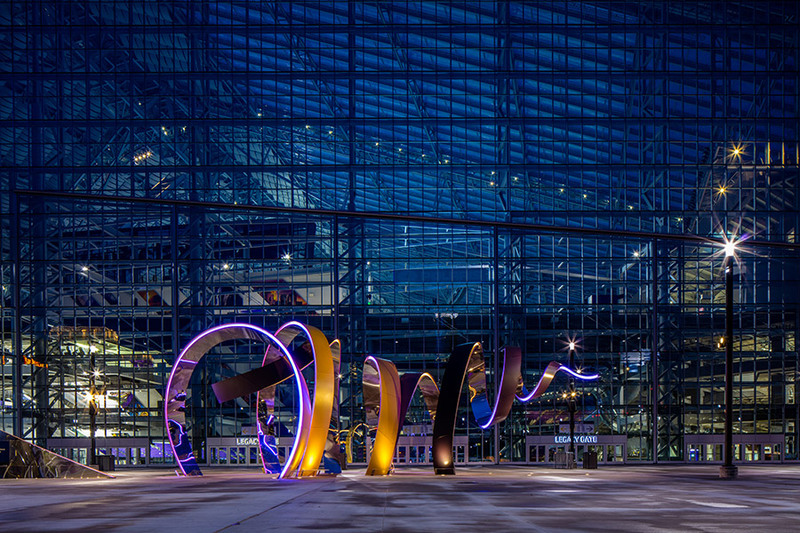 The design minimizes the thickness of these ribbons, using the sculpture’s curvature to its structural advantage. The greatest structural challenge was the tail cantilever, which extends over 90 feet (unfurled) and weighs approximately 19,000 pounds. The completed ribbons are 36 inches minimum in width by a mere six inches deep. This depth has been further dematerialized through the use of a continuous LED back-lit reveal joint at the ribbon edges that visually separates the mirrored surfaces from the purple and gold ones. Lighting for The Horn consists of perimeter pole-fixtures, recessed up-lighting, and ribbon-edge color-changeable LEDs located behind a custom diffusing lens. This edge lighting is typically set to white; however, programming allows the monument to respond dynamically to game day touch-downs, holidays, and other special events. Electrical and lighting controls are concealed below the plaza, within the edge cavity of the monument ribbons, and inside the thickness of the client’s logo wall. The Horn was digitally designed and fabricated in three dimensions. Without this direct dialogue between concept and fabrication, the monument could not have been completed within the project’s given timeframe, which included just three weeks for procurement and fabrication of the welded structure and 15 weeks for overall fabrication and construction. The structure of the monument consists of thin layers of rolled steel weld-laminated together to achieve required thicknesses. This process of laminating allowed rolling to be accomplished locally and within limited material lead times. Every piece that was fabricated was cut with a laser or CNC router based on digital files that were initiated during design and then converted for use in fabrication, including digitally fabricated jigs and etch marks that guided assembly.